A hint of an eruption. Credit: Eva Eibl (distributed via imaggeo.egu.eu). The photograph shows water that accumulated in a depression on the ice surface of Vatnajökull glacier in southeastern Iceland. This 700m wide and 30m deep depression , scientifically called an ‘ice cauldron’, is surrounded by circular crevasses on the ice surface and is located on the glacier tongue Dyngjujökull, an outlet glacier of Vatnajökull. The photo was taken on 4 June 2016, less than 22 months after the Holuhraun eruption, which started on 29 August 2014 in the flood plain north of the Dyngjujökull glacier and this depression. The lava flow field that formed in the eruption was the largest Iceland has seen in 200 years, covering 84km2  equal to the total size of Manhattan . A number of geologic processes occurred leading up the Holuhraun eruption. For example, preceding the volcanic event, a kilometre-wide area surrounding the Bárðarbunga volcano, the source of the eruption, experienced deformation. Additionally, elevated and migrating seismicity at three to eight km beneath the glacier was observed for nearly two weeks before the eruption . At the same time, seven cauldrons, like the one in this photo, were detected on the ice surface (a second water filled depression is visible in the upper right corner of the photo). They are interpreted as indicators for subglacial eruptions, since these cauldrons usually form when geothermal or volcanic activity induces ice melt at the bottom of a glacier . 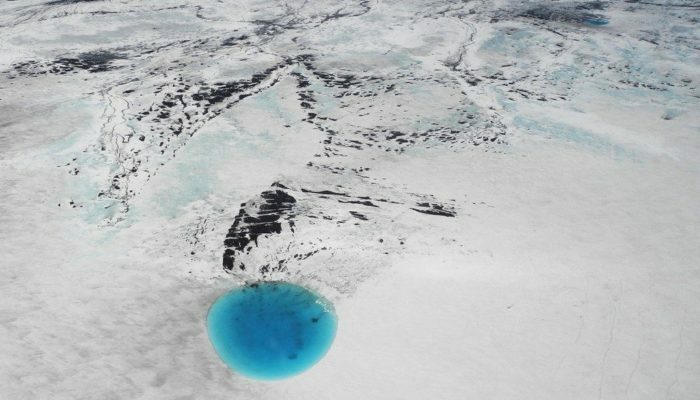 Fracturing of the Earth’s crust led up to a small subglacial eruption at the base of the ice beneath the photographed depression on 3 September 2014. This fracturing was further suggested as the source of long-lasting ground vibrations (called volcanic tremor) . My colleagues and I studied the signals that preceded and accompanied the Holuhraun eruption using GPS instruments, satellites and seismic ground vibrations recorded by an array of seismometers [2, 5]. The research was conducted through a collaboration between University College Dublin and Dublin Institute for Advanced Studies in Ireland, the Icelandic Meteorological Office and University of Iceland in Iceland, and the GeoForschungsZentrum in Germany. Thanks go to www.volcanoheli.is who organised this trip.